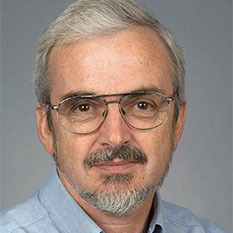 Don Campbell has been Professor of Astronomy at Cornell since 1987. Prior to coming to the Cornell campus he was Director of the Arecibo Observatory in Puerto Rico for seven years and remains closely associated with the Observatory as Associate Director of its parent institution, the National Astronomy and Ionosphere Center. Campbell's research work is in the general area of planetary studies with a concentration on the radio- wavelength-scattering properties of planets, planetary satellites and small bodies. He makes extensive use of the high powered radar systems on the Arecibo telescope. Recently, working with past and present Cornell graduate students, he has "explored" the polar regions of the Moon looking for evidence of ice deposits, studied the radar scattering properties of the icy satellites of Jupiter and Saturn, Europa, Ganymede, Callisto, Titan and Iapetus, and used the polarization properties of the reflected radar signals to investigate surficial deposits on the surface of Venus and to look for regoliths on near earth asteroids. Photo and biographical information from Cornell University.